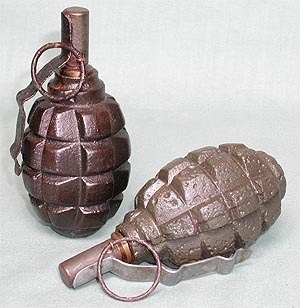 This is the F-1 Fugasnaya ("high explosive") fragmentation grenade made and used by the Russians during WWII. It has the early Koveshnikov fuze, made of brass and steel. This fuze design was replaced by the UZRG type sometime around 1942. The body style is slightly different that the modern F1 types, being more angular and exhibiting small notches in the neck and base. When these changes occurred is not clear and could possibly be just variations in manufacturing set-ups. Color varies from a very dark green-brown to medium olive. The grenade to the right in the top photo shows extremely poor casting quality. Crude workmanship tended to be a hallmark of Russian weapons design of the period, but they were none the less effective. The steel safety lever and fuze cap are a one piece unit, which is spring loaded and pops off when released. 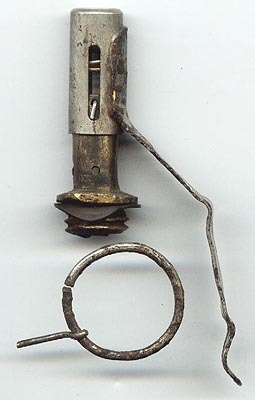 Inside the brass fuze stem is a cocked striker under a second spring, held safe by a steel ball indented in the side. This ball is freed when the cap departs, releasing the striker. 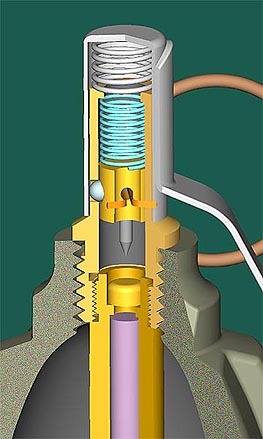 The stem has a hole in the top and the striker is grooved to vent gas from the burning delay, which is about 4 seconds. Three F-1 bodies, which I believe to be all WW2 vintage and with their original paint. Here are two fuzes striped down. Interesting to note that there are two distinctly different delay stems. I can find no references to the reasons. Drawings I have from Russian manuals show what appears to be the larger of the two. 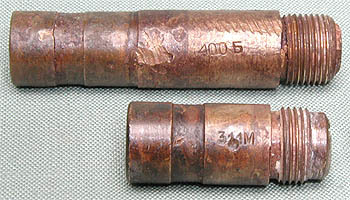 An enlarged view of the stems which have the only markings I can find on the fuzes. The top reads "400B" and the lower "311M"
Paul, from the U.K., provided additional information about the WWII F-1. This fuze has a slot cut in the side of the cap for an additional limiting pin which prevents the cap from flying off. Enough travel is allowed so the locking ball will still be free to depart when thrown. Why was this a desired feature? Maybe the handle prevented the grenade from rolling on the ground? This design is shown in a Russian training manual from 1944. No mention ofthe previous fuze, with the fly-off cap. It all works the same, as far as the soldier using it is concerned. 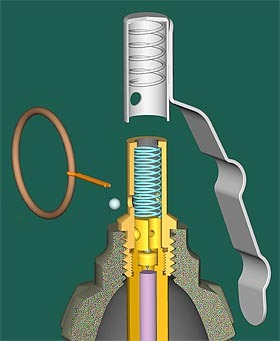 An enlarged view of the fuze. Here is another mystery to ponder. 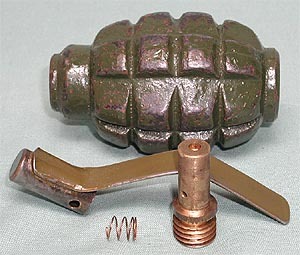 This grenade has a lever that seems to be a transitional type, between the Koveshnikov and the UZRG fuzes. The fuze stem however is non-functional. There is no through hole in the top, nor is there a hole for the locking ball. While the inside is threaded, it is too small for the fuze elements above. 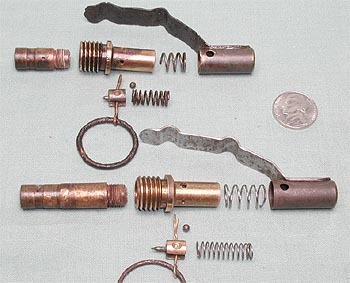 The spring shown is a replacement. The corroded remains of the original are inside.